It's been a year since the disappearance of Shiro, the Silver King; Kurou Yatogami and Neko have been diligent in their search, but to no end. Their investigation leads to a run-in with members of the now disbanded Red Clan HOMRA—Rikio Kamamoto and Anna Kushina—being pursued by the Green Clan, who desire Anna's powers for their own ends. Now, the members of Scepter 4 are called upon alongside Kurou and Neko in order to rescue Anna, the mascot, and only female member of the ruined Red Clan, from the enemy's clutches and hopefully find Shiro using the young girl's powers. Amidst crisis, the group is forced into a power struggle when the Green Clan threatens to overtake the Gold King's domain. The second step in the K Project series, K: Missing Kings, continues the story of a young boy caught up in a psychic war between seven kings, and showcases each character's struggles after the losses of their respective Kings. The movie was first premiered in Singapore on July 5, 2014. Screening in Japanese theaters began on July 12, 2014. This is my second time reviewing on an anime so bare with me. I'm still getting used to this. When I had preordered the tickets for this movie I had no idea if it'd be a recap of the anime. To my surprise it wasn't! It actually continued from where the anime had left off. They did a very nice job continuing but also bringing back a few flashbacks to refresh your memory on what exactly happened in the anime. Yes this movie was fabulous but the cliff hanger at the end. The story gave somewhat of a closure on what the anime had left off on Mikoto's death and The silver king's disappearance. However, it just left more questions, and hopefully a hint that a second season would be made. I really liked how they brought in Mikoto and Tatara in a scene, that gives you closure on their deaths. It was hard to accept they have died, and it brought me to tears, but you get to see them happy hanging together. I love how this movie introduced a new clan and had some funny jokes mixed in with the seriousness. The art was beautiful as ever. They had kept the same art style as from the anime and more sparkly effects. It was an emotional thing for me. That it'd been awhile since the anime and here they come out with a movie with the same art style. It was beautiful and seeing it on the big screen, it's a moving experience. Especially since that was my first anime movie watching in the theater. K project has beautiful OSTs. I know some of the OSTs played in this movie were from the anime and it was majestic. Again, considering I saw it in theater, the sound was amazing. The audience was quiet, and it was like you were watching it in a dark room at your house. Except for me, the screen was bigger and better sound. The voice actors are original with a couple new ones. The characters are amazing as ever. The new rival as well, Yukari Mishakuji. He is one smoking hot swordsman. He has a very distinct personality. Very nonchalant and sly type. As mentioned on his bio, he is Kuroh's former senior. Yata, Mikoto, Anna, Kuroh, Neko, Tatara, Fushimi, Seri, all of the old characters and new ones are fabulous. Though one thing I wished was that they would have made the HOMRA clan more real. The only ones they really put time into was Yata, Anna, Kusanagi, Tatara, Mikoto, and Rikio. I read K:Memory of Red and it introduces the other clansmen in HOMRA. I felt they should have made the other members more than just a clansmen who is just there apart of the team. In the manga, it shows how they all joined, they all are very lovable. Overall, I love K so much. This movie and anime. The cliffhanger sort off left me like "That's it?!" It had wonderful animation, beautiful background music, touching characters, and it was just great. I really suggest people to watch this movie. It will give you a huge rollercoaster ride of emotions. Plus also make you laugh. Thank you for reading my review, I hope I get better at these. I just was really passionate about this movie, I had to write a review. I went to see it twice. 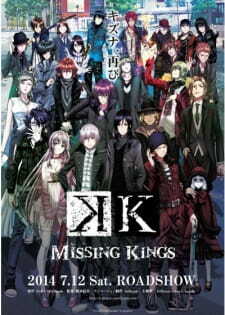 K: Missing Kings is an extremely good addition to the series. It presents us a fresh story, with the inclusion of a few faces not seen in the series and is worth your time. This review may contain a little spoilers so if you're reading this while you're in the middle of the series you might wanna avoid it reading this. The story in the film follows after not more than a year has passed since the incident involving the Silver King, the Red King and the Blue King. The people of the HOMRA group have since disbanded and got off to live on their own. Anna, the mysterious little girl who used to always hang beside Suoh Mikoto aka the Red King, is depicted as our main character here. She's seen to be chased by two other mysterious looking guys who happen to be the Clansmen of the Green King. Yes, this is the first time the Green King is introduced as he did not have any part to play in the series. Yukari Mishakuji is the one serving for the Green King and is our main antagonist in the movie. He's later revealed as a former senior of Kuroh Yatogami who also was the student for Miwa Ichigen. For purposes unknown, Yukari leads the kidnapping of Anna but face off against Kuroh and Neko, who are in search for the disappeared Shiro. The artwork for this was once again a visual masterpiece as was the case with the series. The CG effects were right on the money too. The voice actors stay the same from the series. The movies uses some of sound effects previously heard on the series with the combination of some of its original themes as well. And it was a bliss to hear the ending song done by Angela. Honestly after watching the movie, I think "Rebirth of the King" would've been a more appropriate name rather than the one it has. Sure it does give us an insight to the never seen before Green King but that actually acts as a sub-plot giving the main role to a more sequel-like story. To fold it off, K: Missing Kings is an absolute must watch if you're a fan of the series. It's totally not a recap and has its own very interesting storyline with the addition of some new characters. The film does not have a full conclusion to the story though, as it's actually not supposed to be one. With the announcement of the new sequel to the K series to air this fall, the movie also acts like a considerably well done prologue to it which means all the more reason to watch it. "All you ever do is cling on to things. You'll never be able to go anywhere unless you learn how to let go." Those are the words of the main antagonist of this film, Mishakuji Yukari. What do they mean? Are they true? Bearing with the loss of their beloved King, the members of HOMRA disband and go their own ways, leaving Yata to spend lonely days at the bar watching old videos Totsuka had recorded, Rikio and Anna spending their days together, other members hanging out and avoiding the bar. However, how long will the peacefulness last? This film was intended to be the closure to the cliffhanger of the original story and, in my opinion, did a quite good job there. It answered a lot of questions and gave us more insight on the deaths of Totsuka and Mikoto we had already witnessed in the anime prequel. However, I must say I was confused at some points of the film and it made it harder for me to continue watching it. At some points I had to pause and go back a bit so I would understand what was going on. With more questions answered, we just got more questions to ask - Why did this happen? What did this character mean by saying that? What has just happened? I'd say that the story, compared to the stories of some other animes or the K anime prequel, was not well-written and it did not reach its potential. The art of K stays flawless in this film as well. The scenery, the colours - ah, nostalgia! I especially liked the lightning and the animations of flames and special powers the characters used during the film. The animation is splendid - I re-watched some scenes way too many times! What could happen with an amazing voice actor cast and the people who did the OST for the original series? This film. The voice acting was beautiful as always and the OST just made the whole thing shine even more. I especially liked the fact that some of the tracks from the original OST were used. There was also a song sung by Anna and I got goosebumps! The only thing that bothered me a little bit is the parts where the background music was a bit louder than the voices, but it can also give it more charm for others. Overall, majestic. I really liked the original characters and it was really nice seeing them in action again. Some of them got more development and some of them were shown in situations we've never seen them before, which was refreshing. The main antagonist of this film really caught my eye and I saw a lot of potential in him, but in the end I ended up a bit disappointed. We never got to see any background story on him or character development - just a plain, shallow character who served to trigger the plot. I wish the creators put more effort in developing him. As a former K fan, I enjoyed this greatly. It was so nice to see K back again without having to re-watch the original series. There was just enough action, as well as comic relief moments and some moments that could bring one to tears. The music and the animation just make you let yourself be sucked into the world of K. It was truly a magical experience. Overall, this film was very good. It had a good amount of everything and I'm sure it'd be a nice experience to all of you K fans. I give it an 8 because of the lack of story and character development, but I also recommend it to all of you. At least it's worth giving it a try. This story teaches and shows us people at a whole new start, people forgiving and being forgiven. In this film you'll see people letting go of old, and embracing new bonds that will certainly change their lives towards better. After waiting a long time for the DvD release, I'm glad I wasn't disappointed. You guys won't be disappointed either! Continuing from the last arc of K: The Animation, the plot has gotten much bigger with the new characters. Deep story, taking K: The Animation as a base, the love/hate relationships, including a shady king who makes a move on some other king. Can be a tear jerker for some people, while for the others it can pump you with adrenaline. At some certain points, you feel as if it's real life. Perfect art, no! Beyond perfect. Outstanding fights, graphics and characters. Everything is top notch! The usual chill tracks, one of the most crucial parts that was done well. Strong tracks when needed. Giving you a relaxing sensation full of enjoyment. Some people won't like the fact that it's over-chill sometimes, and some others might not like the plot twists, but.. As for the K fans, they'll love it to bits. Even the minor characters get a chance of taking a part of the new movie! Great movie, you definitely should give it a shot!